2nd Service carried out today on our 2017 Commodore. 8000 miles and 170 nights and all is well. Some slight shrinking of the mastic around the outside locker doors and peeling of the wall board joining strips inside. Well done to Leisure World Group Catterick for the swift attention to detail service. Thank you for the feedback. I will be sure to pass it onto our service department. Thought you had gone into hiding Vicky! Ha ha ha . .. no. I pop on and off a couple of times a week so I’m always around to DM if anyone wants me. Will be in to see the rest of the family on North Yorks rally end of month. Gosh ... it does not seem a year since the last one. Mum and Dad were up last week at the Motorhome event but I wasn’t able to make that one. Hi my 2017 has the same problems. Hymer have accepted a warranty claim for the sealant. However deny responsibility for the jointing tape. Does anyone know where I can find the correct one to replace it myself? It is the responsibility of the dealership to fix the jointing tape under CRA 2015 as it is an inherent fault. It has happened with just about every caravan that has rolled off the line. Before we even took delivery the jointing tape was peeling back. 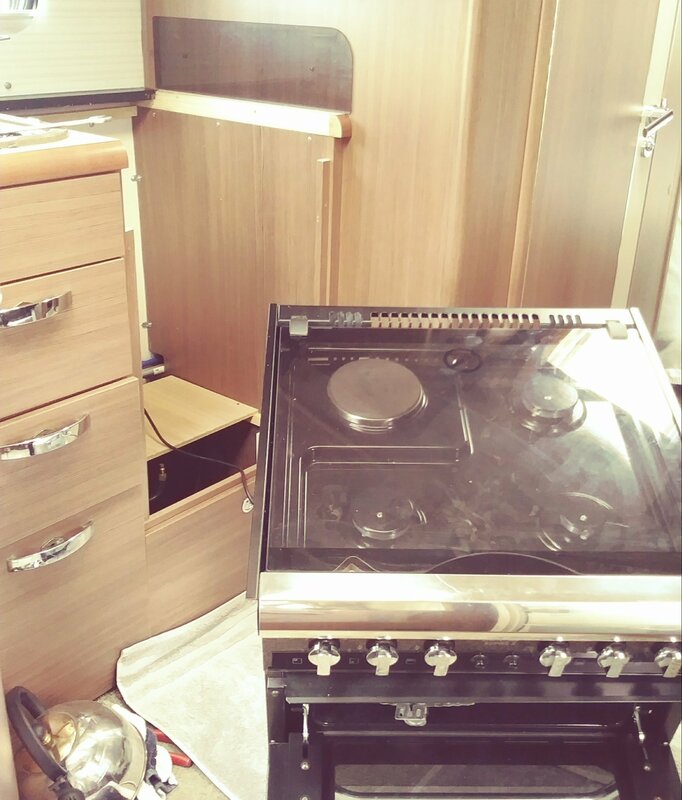 It is not your concern that Elddis are refusing a warranty claim for the jointing tape. I was at the caravan show in Glasgow last week and had a look in the new Commadore on the stand and noticed that most of the jointing strips were faulty and that is on a show van. Listened to a few people commenting about it. I think the issue applies to just about every brand. On a previous Lunar Delta we had the "D" shape trunking fitted over the joins. It looked neat and never had an issue with the tape peeling again. Just starting our third season in the Commodore. Took it locally for a few days to run it up and debug the system before coming South. It had been laid up since November, jacks extended and front raised as far as I dared to improve water run off. Very pleased to report that with one exception everything fired up and is working perfectly. The exception was that the battery was down at 12v and the smart charger I use at home indicated 60% capacity which was alarming for a 3yr old battery. I use a Ring smart charger which I find so effective I reckon it could raise the dead. Which it did. Anyway fault traced to an unsecured wire on the Truma charger connection to the panel. Clearly this was badly done at the factory as the terminal was tightly screwed down not gripping the wire at all. It must have been just touching most if the time and finally shook out. Fixed and fine now. Hi Ian. I hope the others from our once vociferous group also have similar stories to tell. 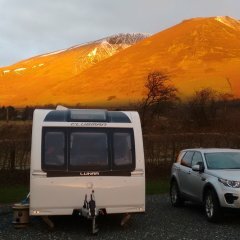 We have done about 100 nights/year since getting the van, so a similar story to yours. On looking through our records I see our 2012 Cilpper lasted 23 months before the nearside cracked. So I am not complacent! Could not decide where to put this but I think we have lamented the poor performance of the Thetford Aspire 2 grill before so I thought I'd post it here for potential fellow sufferers. Wet and windy day in Devon so I thought I'd sort it. 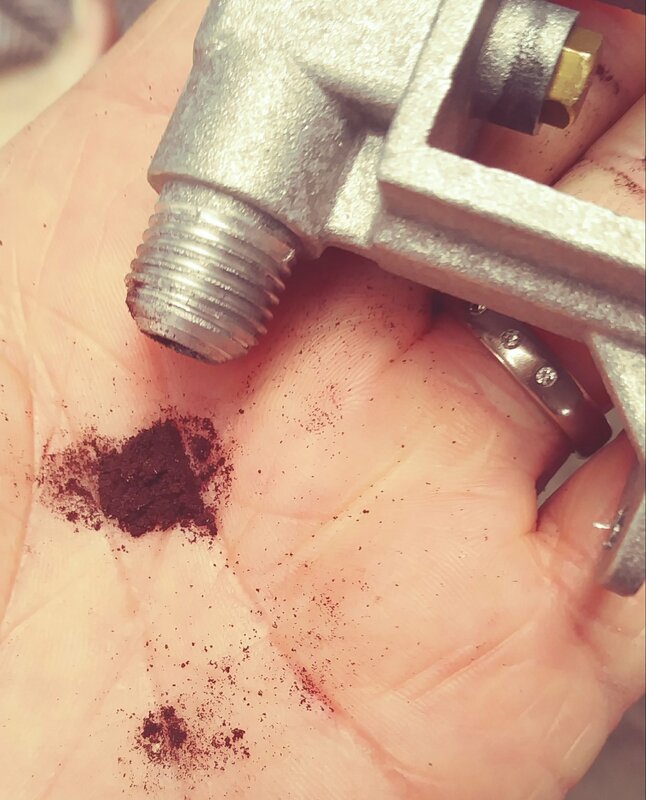 Had to take cooker out to get to grill jet housing and found a lot of red-brown dust. Not sure if it was gas borne or in the pipes when assembled. Anyway its sorted and working perfectly. Previously I paid local repair man £20 to fix it but he only did it from front with air line which of course solved nothing. She is just 2yrs old. I'll have a look at the rubber hose although I'd be surprised if it had gone. I'd suspect it was muck in the pipes left over from assembly which has made its was along. We are only on our 3rd or 4th gas bottle in all this time but I suppose it could also be contamination from the "Lites" which are now being withdrawn. TBH I just don't know. I could do with some of this too Ian. I occasionally re-iron the tape via a cotton cloth and it sticks for a while but then the edges lift again. As for the external mastic on arches and lockers, I see there is some separation round the wheel arches and I had one trim panel on the rear N/S corner replaced but it is cracking again. Cosmetic stuff but irritating. Had a look at the gas tails and although the van is only 2yrs old I had transferred them from previous Bucs. One was 2011 and the one in use was 2016. Neither showed any signs of the red dust. However, I'll replace them both. So another issue reared it's head as pictured. 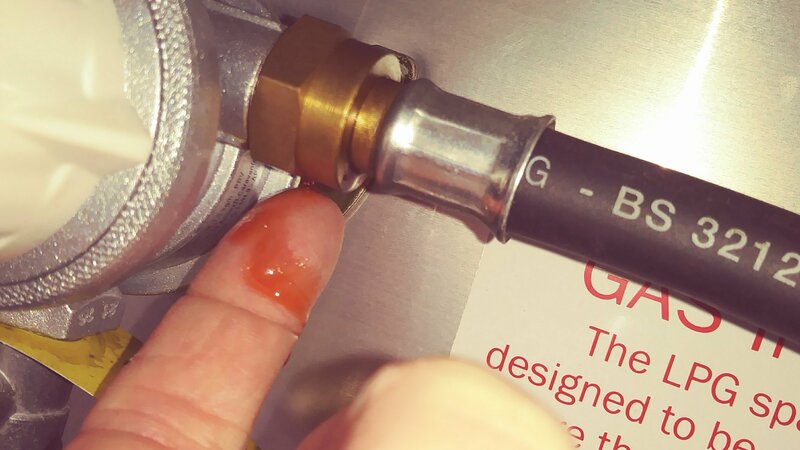 A red oily liquid present at both ends of the working gas tail when released. Talking to on site Caravan service guy as we left he said Calor had had trouble with oil in cylinders and had been in court with Truma over it. Our Gas Lite cylinders are little used so I think they'll be a year or more old. I think I'll change them both too. I hope oil has not spread into gas changeover valve or further in to systems. I'm not sure I understand this oily residue business. Most of caravanning is off grid so we go through a lot of gas. We have had one truma regulator fail about 6-7 years ago since then same regulator actually a cavnga unit no problem but I know of plenty of people who are still on the original regulator and use a lot of gas and haven't had a problem. What I am trying to say is it doesn't seem that the problem is related to the amount of gas that is used. Re: Safefill, Like them so much I have 2 of them. I bought the latest in September last year and on Sunday I filled it and I can't remember if that was the 5th or 6th time. Makes a lot of sense for me but if I was getting through 6kg a year I don't think it is worth it. Just my opinion. Fair enough and by the way I'd say that I am not connecting the dust in the blocked grill jet with the oily drip I found on both ends of the pigtail. I was disconnecting the pigtail to check if it was crumbling inside; it was not but it was a few years old so I have changed it for a two year old one and intend to buy another tomorrow. Starting afresh and hoping that the reddish oil has not gotten into the auto-changeover valve which I presume is also a regulator. It was all working properly so I think not. I have 2 Calor Gas-lite cylinders and I checked the empty one at home by inverting and opening the valve. There was no residue in the output so I am assuming that the partially full one is the only one affected. We only use between one and two cylinders a year and always singly to keep noseweight down so the auto-changeover function is never exercised. I have looked on line and seen that this issue stretches back to 2010 and there were a lot of posts on this forum during 2013 concerning Truma v Calor. I see the layout issues being mentioned and the use of filters and I am wondering about fitting one as an additional safeguard. Any advice from those that have been through this issue is welcomed. Similarly I know nothing about Flowgas. Better look that up. Presumably, both Calor and Flogas buy their gas from the major oil companies as the gas is a fraction of the crude oil. Re Safefill, I now fill mine out my local Morrisons less than a mile from where we live and currently 55.7p a litre, so 6kg costs approximately £7. However I have seen the tanker that delivers the bulk gas and it says Calor all over it. So if you think that the gas is the source of the oil then I can’t see that what I put in my Safefill is any difference to the Gas in your Calorlite. I would assume that the Auto change over fitted to the Buccaneer is also the regulator, this looks identical to the one I have fitted. For you about as useful as a chocolate teapot, for me the second best gadget ( after the solar panel ) I have ever fitted. Just goes to show that we all use our vans in different ways. Regarding the oil filters, these look the same as the one fitted to compressed airline to trap oil, it would be interesting to know the price difference. I don’t think anyone has really got to the bottom of the oil problem but it did seem to correspond to introduction of pigtails and bulkhead regulators. 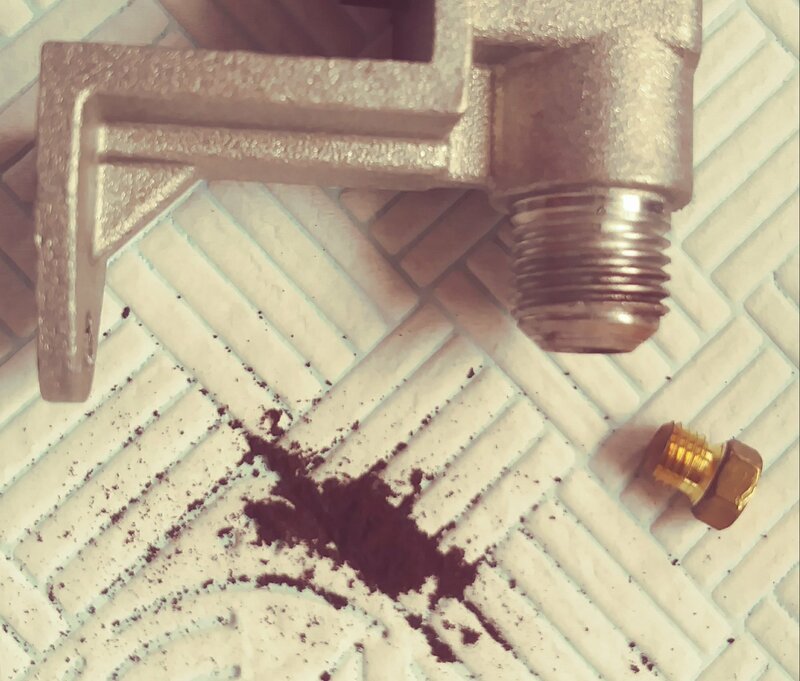 Its well documented (and I did the links years ago) that the oil is the plasticisers displaced from the rubber hose by the LPG gas, the advice then as now was to use the stainless steel hose. At the time it was advised that the regulators were fitted higher than the bottle so the liquid drained back to the bottle rather than cure the plasticiser problem.